At 585 Dundas St E. The Regent Park Lounge is located in the heart of the vibrant Regent Park neighbourhood. It is a bright and modern space brimming with arts and culture. An intimate, open-concept space perfect for roundtables, symposiums, charrettes, storytelling, product launches, community events, potlucks, and more! Take a virtual tour and see for yourself! Prices: starting at $120/hr. Click through for a full list of prices. Questions? We want to hear from you! Send us an email. Many a startups have been launched out of someone’s garage. CSI’s Garage is a more intimate space located within our Annex Lounge at 720 Bathurst (Bloor and Bathurst). Perfect for lectures, book launches, smaller socials, team meetings, AGMs, storytelling, brainstorm sessions… almost anything! Please note there is no air conditioning in this space. No animals except for service animals are allowed on the CSI Annex ground floor due to the CSI Cafe. Thanks for your understanding. If high ceilings, exposed brick, and vintage furniture seem like a good backdrop for your event, then you’re in the right place! The Annex Lounge is an incredible multipurpose space with a built in presentation room that also functions as a CSI Members’ Lounge when not being used for an event. Now fully licensed, we can also serve up local beers and wines for your event! Stay tuned for information about an in-house cafe offering as well later in 2016. Perfect for larger conferences, launch parties, fundraisers, almost anything! Prices: starting at $165/hr. Click through for a full list of prices. The Atrium is an open-concept space adjacent to an open kitchen space, perfect for book launches, readings, small socials, and large meet-ups. Please note there is no air conditioning in this space. The 192 Spadina Lounge is CSI’s newest Event Space located in downtown Toronto’s Queen West neighbourhood (Queen and Spadina). A large, beautiful venue perfect for medium-sized conferences, larger socials/meet-ups, fair-style events, and more. The 192 Lounge includes 3 breakout rooms, 1 plenary space, access to an open-concept non-commercial kitchen, and the Atrium for gathering and socializing. Climate Ventures is a medium sized space with lounge, screen and projector, a kitchenette, and 2 private washrooms. 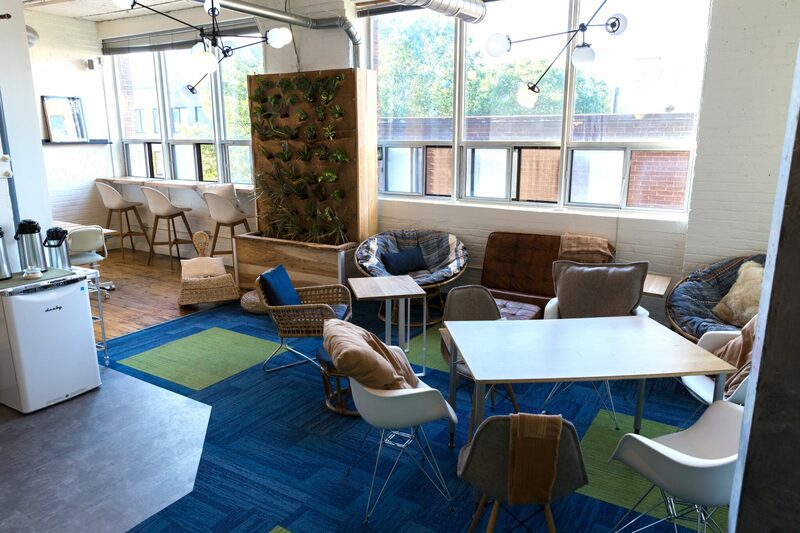 Climate Ventures’ space was designed by Peggy Sue Deaven of Peggy Sue Collection, an award-winning, Climate Ventures-accelerated venture, for functionality, connection, and inspiration. Almost everything in the space has a sustainability story, such as being made locally by a member (green wall by Ripple Farms, tables by Just Be Woodsy) or out of low-carbon materials. Even the light fixtures are in the shape of an HFC molecule made in Cabbagetown. We require 15 business days to cancel your booking without any financial consequence, otherwise the full amount of the booking will be charged. Please read these important guidelines to get information about accessing the space after-hours and on weekends, where to find your equipment, and how you will be invoiced. Learn more about our event space through the Frequently Asked Questions. *NON-MEMBER PRICING: As a community, we want to support the growth of the social mission sector and we know it can be tough for smaller organizations with more limited resources to achieve impact + scale. We offer tiered pricing to give the little guys a helping hand. Tier 1 applies if you have <$250,000/year operating budget. Tier 2 applies if you have >$250,000/year operating budget.